Italian Cinema Today: Tribeca Film Festival to Feature the latest Italian Masterpiece - "Perfetti Sconosciuti"
Tribeca Film Festival to Feature the latest Italian Masterpiece - "Perfetti Sconosciuti"
I read a quote about Paolo Genovese’s “Perfetti sconosciuti” (Perfect Strangers) - “Un film che rimane impresso, prima nella pancia e poi nella mente.” –A film that remains first in the stomach and then in the mind. That sums up how you will feel upon watching the film. If you’re a filmmaker, you will take it one step further by asking yourself, "Why didn’t I think of that?” This is a universal story, a testament to the times in which we live. If I was limited to one word in reviewing this film, it would be, genius. That word covers just about every aspect of the film from the writing to the directing to the acting to the lighting to the set design to the wardrobe. Each person, every detail made “Perfetti Sconosciuti” a true masterpiece. I watched it several times before I attempted to write this. The first time, I just read the subtitles. The second time, I focused on the performances and then I watched it again to pay attention to the production details such as the warm, ambient lighting, the placement of the phones, the spectacular editing of the cut-a-ways and dialogue, the countless props in the carefully-styled homes and the timing of the glances from room to room. I also found the cinematography interesting. It seems to have echoes of documentary or news style filmmaking. You can see it in the screenshots I posted with that classic interview lead-room. I'm not sure of the intentions, but this crisp, clean style really helps in making the quick cuts during the conversations easy to follow. “Perfetti sconosciuti” takes place over the course of one evening, primarily in one home at a dinner party that coincides with an eclipse of the moon. The group of 40-somethings consists of three couples and one friend that claims his girlfriend fell ill and could not make it. Upon discussing the breakup of a mutual friend’s marriage after the wife found a text from her husband’s young mistress, Eva dares everyone to put their cellphones on the table and answer all calls and messages publically in an attempt to uncover any secrets the friends may be hiding from one another. Apprehensive, the group accepts this sort of dare and what follows is one life-changing, unforgettable evening. Aside from the compelling story and plot twists, what impressed me the most is the ease with which these characters interact with each other. It was like watching old friends. And come to think about it, indeed they are. Marco Giallini and Valerio Mastandrea go back 20 years when they worked on the television movie, "Infiltrato". They have since worked together on numerous projects. Giuseppe Battiston and Mastandrea go back about 10 years with projects like Gianni Zanasi's "Non pensarci". "Perfetti sconosciuti" is a film that raises a lot of questions about our own lives since the emergence of social media, smart phones and applications that perhaps make it a little too easy for wandering, unfaithful or just curious significant others. The performances are too powerful to lump into one paragraph, so let’s take a quick look at each one individually. I'll start first with Cosimo played by Edoardo Leo because I interviewed him last year and he told me that he was tired of being typecast as the "hero". Well then he must have really embraced the backstabbing, homophobic, judgmental, cheating, lying scumbag of a double-standard character he found in Cosimo, to put it lightly. Leo demonstrates a certain finesse and confidence in his portrayal of this character. Again, the word genius comes to mind. It is a genius and seemingly effortless performance. From the mustache and long, angled sideburns to the smirks and smarmy glances, Leo wholeheartedly transformed himself into this detestable Cosimo. There’s a little bit of Alba Rohrwacher in every character she plays. Bianca, Cosimo's unsuspecting wife, is no different with that signature deer-in-the-headlights look, and as usual, it really seems to work. Rohrwacher gives her characters a certain vulnerability, even if they are strong-willed and intelligent like Bianca. She can play a real lunatic but she can also play the sweet girl next door. I wasn’t sure how’d she do with Anna Foglietta and Kasia Smutniak. She does bring a different sensitivity and perspective to the table, but again, it really works. As she mentioned in the beginning of the film, she was nervous the first time Cosimo introduced her to this group of old friends.. and that signature Rohrwacher gaze gives the impression that she still is not totally at ease with them. In one of the opening scenes of the film, Lele (Valerio Mastandrea) is hiding in the bathroom texting on the cellphone application, Whatsapp, with a woman he’s never met. I actually didn’t catch this the first time around because I was reading the subtitles. So if you are seeing this at Tribeca and you’ll be following the subtitles, make sure to glance up consistently because there is a lot going on that words don’t convey. That moment in the bathroom is key later on in the film. 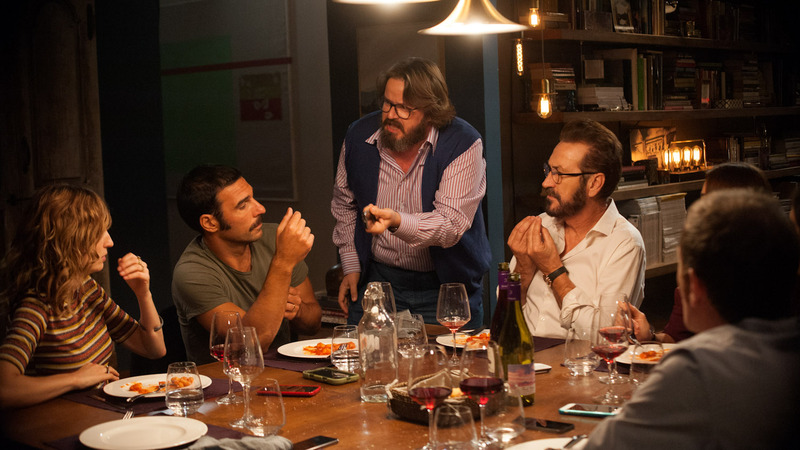 Mastandrea was nominated for the David di Donatello (Italian version of the Oscar) for his role. It's an honor that is well-deserved. Lele is always in movement. His dumbfounded expressions toward Peppe and his passion and desperation in defending himself are nothing short of intense. Of all the characters, I felt to care about Lele the most because he's just a good, humble person that lost his way in life. He also seemed the hungriest of his friends. There is rarely a moment that he is not chewing. This amused me throughout the film once I noticed. Carlotta (Anna Foglietta) is another David di Donatello nominee. If there is a show-stealer in this film, it is her. Foglietta poured her heart and soul into Carlotta and came alive in this role. Not only is her character entertaining to watch with her attentiveness, gazes and expressions, she is also wise, and after acknowledging that she and her husband have been through hell during the last couple years, makes us ponder the question "Why don't people learn to split up?". It's a good point and makes you think. Speaking to social media and messaging apps, when is the line crossed into infidelity? At what point does a couple throw in the towel and walk away rather than look away? Rocco (Marco Giallini) is the calm, cool, virtuous one of the bunch. Another David di Donatello nominee, his performance was simply stellar and above all, strikingly natural as he carries most of the responsibilities of hosting this dinner party and being the voice of reason for the hot-headed Cosimo. There is a very endearing scene in which he offers his teenage daughter advice about a huge step she's about to take in her life. A plastic surgeon, he delivers a couple of sassy wisecracks about his profession. I really enjoyed his character. Giallini is always such a pleasure to watch. Each role is so different from the last. His range seems endless. I credit the talent of the actor when I don't like the character, and I really did not like Eva, played by Kasia Smutniak. Although she provided quite a shocking scene towards the end of the film, I found Eva to be annoying. She is judgmental and has a sneaky way about her. She complained through most of the film, showing her husband just a couple moments of affection. In Eva's defense, she is going through her own mid-life crisis, struggling through the difficult years of raising her teenage daughter, even though in reality, Smutniak is not even 40-years-old. My only criticism is that I found her character out of place at times. Eva just seems a bit young, emotionally and physically, for this crowd. Smutniak reminds me of a young Judy Davis. There is a ton of possibility there. The first time I saw Giuseppe Battiston was in Silvio Soldini’s 2000 film, “Pane e tulipani” when he played the mammoni detective, Costantino Caponangeli. Since then, the diversity of his roles has been fascinating to watch. With Peppe in "Perfetti sconosciuti", he returns to the innocence of Caponangeli, a simple man with not so unfounded fears. Peppe is the only character representing the single person without children and he made thought-provoking arguments about why couples choose to have kids, saying that some pour all their attention into children, thinking of nothing else. He opens the flood gates to a conversation in which many motives for having children are brought up, such as selfishness, fear of growing old, and a chance at a second life by living again through them. Peppe makes us ponder the question: Is having children selfish or selfless? That is the beauty of this film. It makes you think. Add the totally unexpected ending followed by the beautiful theme song by Fiorella Mannoia and we are reminded once again of the uniqueness, the artistry and the infinite dreams of Italian cinema. If you are in the New York City area, don't miss this film. Click here to buy tickets. Watch the video for "Perfetti sconosciuti" by Fiorella Mannoia..